Notes:Width dimension does not include fittings or mounts. 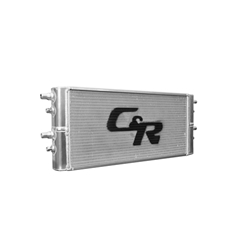 C&R Racing heat exchangers are just one of many options you have from C&R Racing to help keep your oil cool. They feature a superior design that utilizes high quality materials to give your vehicle the highest performance possible even under the most extreme conditions. When you're crammed for space, C&R Racing heat exchangers are the perfect route to go to help you place your heat exchanger in an alternative location. They are available anywhere from a 10 to 22 plate count to give you all the cooling you could ever ask for and will work great on any vehicle you're driving, whether it be a sports car, 4-wheeler or high performance street rod.